Efficacy and safety are the two key elements in the drug discovery and development processes. The primary goal for pharmaceutical research companies is to identify and manufacture therapeutic agents that are safe and efficacious for patients. In principle, benefits versus risks have to be considered for target patient populations. The risks are relatively high in life threatening diseases, e.g. cancer, compared to general areas, e.g. inflammation. Pharmacology, medicinal chemistry, pharmaceutical sciences, safety assessment, drug metabolism and pharmacokinetics (DMPK), clinical research, etc. are the essential multidisciplinary R&D functions assembled within the pharmaceutical R&D engine to accomplish the aforementioned mission. Pharmacokinetics (PK) is generally viewed as the universal biomarker which reflects the processes of how a drug molecule is absorbed (e.g. ka), distributed (e.g. Vd) in the body, and cleared from the body through metabolism and excretion. 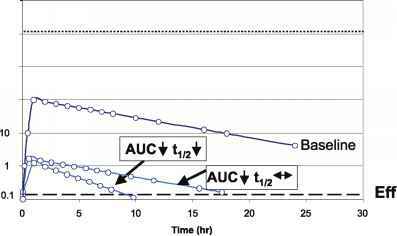 The area under the drug plasma concentration versus time curve (AUC) provides an indirect assessment of the exposure level and duration of action of the therapeutic agent at the site of action (e.g. synovial fluid, tumor, brain). An ideal drug candidate should possess a plasma drug level which is above the therapeutic concentration (i.e. efficacious) and below the toxic concentration (i.e. safe). In general, the therapeutic index is calculated by dividing the plasma exposure at the NO (toxic) Effect Level (NOEL), or NO Adverse Effect Level (NOAEL), by the minimum plasma concentration required for efficacy (e.g. EC50) and the safety margin is calculated by dividing NOEL (or NOAEL) plasma concentration by the maximum plasma drug concentration (Cmax) achieved at an efficacious dose. The wider the safety margin, the safer the therapeutic agent, the lower the need for drug concentration monitoring. The definition of therapeutic index changes a bit for cytotoxic molecules in the oncology area where it can be considered as a ratio of exposure at MTD to that associated with efficacy. In the preclinical setting, the therapeutic index naturally is calculated based on the available data (e.g., pathophysiologic data, animal safety data, and projected human PK data). Pharmacogenetic expression and polymorphisms of drug metabolizing enzymes and transporters (i.e. drug disposition proteins, collectively) as well as interactions of concomitant therapeutic agents with drug disposition proteins are the main causes for inter-individual variations of drug exposure. The so-called "drug-drug interactions" (DDI) are characterized, in part, as an increase in the plasma drug exposure due to "inhibition" of drug disposition proteins (Figure 1). In some cases, increased plasma exposure is accompanied by an increase of plasma half-life, as a result of inhibition or "inactivation" (i.e. mechanism-based inhibition) of the clearance of the therapeutic agent. DDI due to inhibition of the metabolic clearance can be a safety concern as the plasma exposure of a drug can potentially exceed the NOEL or NOAEL. DDI can also be seen with a decrease in the plasma drug exposure when drug disposition proteins are induced by the concomitant drug(s), which renders the therapeutic agent inefficacious (Figure 2). Induction of drug disposition proteins can also be triggered by the therapeutic agent itself (i.e. auto-induction), which often is accompanied by a decreased plasma half-life. Figure 1. Hypothetical plot of a plasma drug concentration vs. time curve in the absence and presence of an inhibitor for drug transporter(s) (with no effect on clearance) resulted in an increased AUC with no change in ty2. 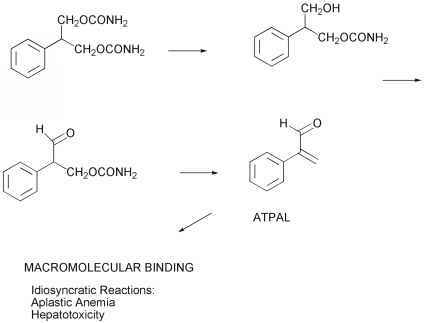 Inhibition of drug metabolizing enzyme(s) by concomitant drug(s) or auto-inactivation of drug metabolizing enzyme(s) by the therapeutic agent itself resulted in an increase of both AUC and t^.